"Watercolours of the Great Exhibition" is a small but exquisite display at the Victoria & Albert Museum (London) running through 14 January. 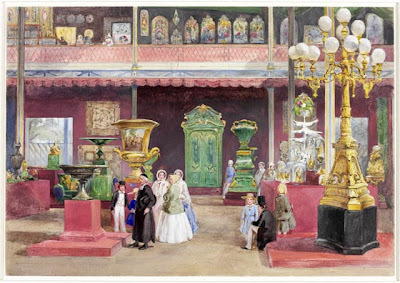 It features 11 watercolours painted in 1851, each showing a different interior view of the Crystal Palace. The exhibition website offers large-format images of all eleven paintings so viewers can see every minute, fascinating detail. They are part of a larger group of images that were reproduced both as colour and monochrome lithographs in different versions of Recollections of the Great Exhibition, a lavish contemporary souvenir guide. The Great Exhibition took place in Hyde Park in 1851 and was the first international "trade show" of manufactured products. More than six million people -- a third of the population of Great Britain at the time -- traipsed to the park to view both the familiar and the exotic among 13,000 exhibits. Shown at top is "Part of the Russian Court" by Henry Clarke Pidgeon (1807-80), executed in watercolour and gouache over pencil on paper. The Russian Court included furniture made of malachite, a bright green mineral, by the St Petersburg firm of Demidoff. The large porcelain vase in the middle of the display is by the Imperial Porcelain Manufactory of St Petersburg. It's decorated with scenes after the seventeenth-century Dutch artist Nicolaes Berchem. Shown below is "Part of the French Court, No. 2" by John Absolon (1815-95), also executed in watercolour and gouache over pencil on paper. The sideboard of carved walnut on the left is the work of the Paris manufacturer Fourdinois. 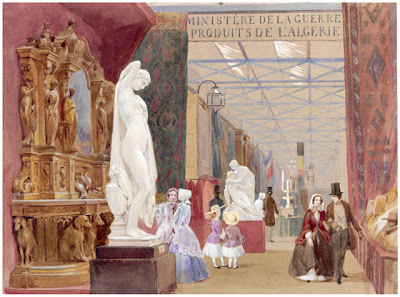 It was discussed in The Illustrated Exhibitor, 13 September 1851: "the design of the artist is to make the ornamentation entirely subservient to its intended purposes."